‘I love Women, Fiction and free Baileys’ faces. Last week, my journalist friend Rachel invited me to be her ‘plus one’ at the award ceremony for The Baileys Women’s Prize for Fiction 2014. If you have read any of my previous blog posts, you’ll know that I am interested in Baileys, Women and Fiction; so I immediately accepted her invitation. She informed me that the dress code was ‘cocktail’. I had a mini ‘whatwillIwear! ?’ panic, before remembering that I had a dress that was both coctailesque and the same colour as a glass of Baileys. Double points for me! I read the short biographies of the novelists and the plots of their nominated novels. I was particularly taken with Audrey Magee’s novel The Undertaking, set in WWII, about a German soldier and his marriage of convenience to a young woman working within the Nazi regime. Hannah Kent’s Burial Rites, a story about a woman condemned to death for killing her lover in 1820s Northern Iceland, also struck an inquisitive chord. It was clear that each nominated book was worthy of the prize. I caught the train to London to meet Rachel at The Southbank Centre where the event was being held. We were both full of child-like excitement; she had a smashing new jacket, and I was so nervous I was having trouble with my pronunciation. We approached the entrance to the Royal Festival Hall and on the red carpet I saw Helen Lederer. I pointed her out to Rachel, and tried to suppress how overwhelmed I was. I know Helen has had a varied and successful career, but in my ten-year-old head, she is still Lady Natasha from Bottom. I tried not to curtsey as she walked past me. We handed our jackets in to the cloakroom, and made our way up the stairs. 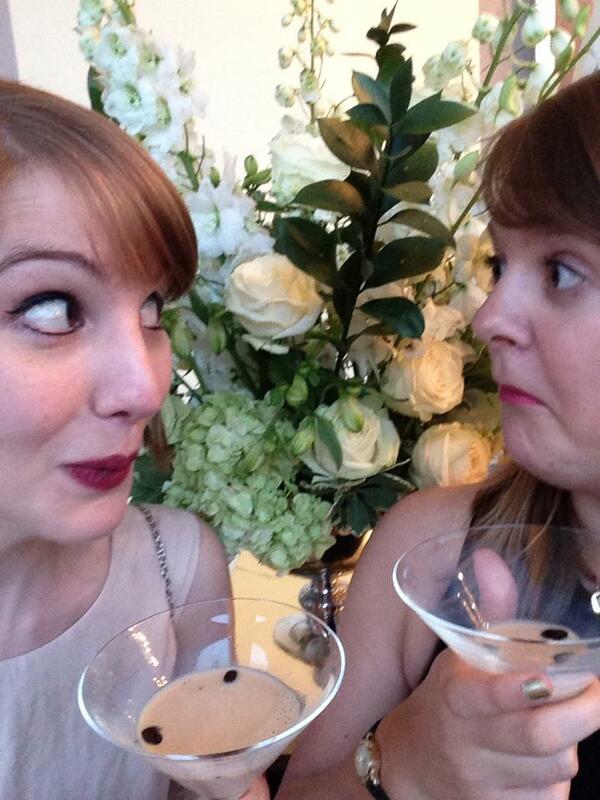 We were greeted by a waiter and a tray of martini glasses filled with Baileys. We took one each, and made our way to the centre of the room to join the crowd of writers, journalists and authors of all different publications. I’d never been to an event like this before; and I was flabbergasted when Rachel told me that all of the food and drinks being supplied were absolutely free. My tiny, student purse strings cheered with relief, and my stomach rumbled with delight. I told her that this event would probably be better than my graduation next year. The chandelier made from the winning books hanging above the bar, was enough to confirm this to me. We finished our Baileys and took a glass of champagne before making our way to the side of the stage to hear Kate Mosse (novelist, and co-founder of the prize) give an introductory speech. Her passion and wit made the room warmer, and my champagne taste even richer. I was distracted, however, by a blonde streak amongst a wealth of black hair; Caitlin Moran. It was Rachel who had bought me Moran’s books How To Be a Woman and Moranthology for my 23rd birthday last year. I’d read them in record time; they’d tickled the funny in my bones and made me proud to be a modern feminist. Rachel & I vowed to approach her, professionally, not ‘OMGITSYOU’-ally, later in the evening. Before the main prize, the winner of the Grazia and Baileys Women’s Prize for Fiction First Chapter competition was announced. Maia Jenkins was the successful entrant, winning the £1000 prize money and a round of applause from the audience. Helen Fraser, the chair of the 2014 judging panel, took to the stage to introduce the nominees for The Baileys Women’s Prize for Fiction 2014. Each author was presented with a majestic bouquet of flowers and photographed with Helen. Finally, it was time: Rachel & I tightened our grip on the stems of our champagne glasses as Eimear McBride, author of A Girl is a Half-formed Thing; was announced as the winner of The Baileys Women’s Prize for Fiction 2014. Congratulatory applause exploded around us, as McBride took to the stage to receive her award. Her acceptance speech was award worthy itself; she stated that before anyone can become a writer, they must be a reader first; and a reader is a ‘fearless’ thing. The room applauded her insight, and I was certainly encouraged by her words. The final word came from Kate Mosse who urged everyone to drink, eat, dance and talk at the Baileys balcony bar. High on life, Rachel & I followed the crowd outside, where we had another glass of chocolate Baileys. With our stomachs rumbling, we decided to head back inside where we could see waiters dispersing through the room with small black bowls of food. We nabbed a couple of goats’ cheese and beetroot salads, and promptly scoffed them down; in between comments such as ‘this is the best goats’ cheese ever’ and ‘this is a bowl of magic’. This was followed by a bowl of grilled artichokes, rice & green beans, a further bowl of grilled prawns, and I scoffed down some shredded pork and rice noodles too. Ultimately, it was a bowl of rare beef and potato salad that stole the show; Rachel & I nearly lost our minds over the intensity of the flavour. After desserts of whipped cream & gooseberries and Baileys & ice cream; we realised it was time to stop eating and time to start talking. We headed back to the balcony bar, where I spotted Bettany Hughes. I had seen her present a series on the BBC last year called ‘Divine Women’ that charted women’s role in religion over the centuries. I was reluctant to approach her because in my post-mind-blowing-beef-dinner state, I’d managed to completely forget her name. I accepted my fate and approached the bar, where Caitlin Moran was in conversation with a group of women. Rachel & I waited very patiently, quietly urging each other to ‘woman up’ and approach her. Eventually, Rachel took the initiative and introduced us to Caitlin, with the opening line ‘I won £10 in a bet because of you’ (which was true, via twitter Rachel & my boyfriend Paul had asked Moran if she had online banking, she didn’t). Moran gave us the friendliest, funniest and most honest greeting; which included the admission of shared desire with Rachel for Arctic Monkeys front man, Alex Turner. We didn’t ask for a photo or an autograph, we were just grateful that she’d spared a few minutes to let us tell her how much we admired her. Feeling like we could do anything post-Moran-talk, we re-entered the hall in search of Mary Beard. Rachel had seen Mary on BBC’s Question Time and had wanted to meet her ever since. I knew Mary was the Professor of Classics at Cambridge University, and that she’d recently been in a documentary about the lack of women’s voices throughout history on the BBC (which I STILL haven’t watched). As we did with Moran, we approached Mary very slowly, so slow in fact, that they announced that the evening was officially finishing. Once again, Rachel took charge and approached Mary. She introduced herself and explained that despite being a journalist, she was attending as a reader, something which Mary seemed to appreciate. Before I was brave enough to ask a question, a further tannoy announced the end of the evening. Mary Beard made her departure, and Rachel & I drank the last of our Baileys before heading to the cloakroom. We were both presented with the most grown-up looking party bags I have ever seen. They consisted of a canvas bag with the event logo on; two (that’s right, TWO) bottles of Baileys, one of the nominated books (I got McBride, Rachel got Tartt), a bookmark, pencil, postcard and copy of Grazia magazine. We skipped down the stairs with our swag, and caught our train home with a filthy burger and chips (to help avoid the hangover the following morning, obviously). Ultimately, my evening with Rachel at The Baileys Prize for Women’s Fiction taught me many things; I can confidently eat and drink an unnatural amount of free food and alcohol, Rachel is the go-to-girl for introductions to your female heroes, and most importantly; fiction is accessible to everyone, whether you are a writer or reader, critic or journalist; or just a lucky ‘plus one’ like me. I left the event feeling infinitely confident in my abilities as a Literature student and blogger (not ‘drunk-on-Baileys’ confidence, actual, genuine, head-held-high confidence). Rachel & I even admitted to each other that one day, we’d like to be one of the nominees; we both feel we have a story or two in us that would be worth sharing.